Jitendra does the finger bend at two places or three. Three is normal. Martijn and Lynn please have a look at this persons mercury finger. What we see here is a very short proximal phalange, because it is quite normal to see the lower interphalangeal crease in the pinky manifest at a location which overlaps with the proximal crease of the ring finger. 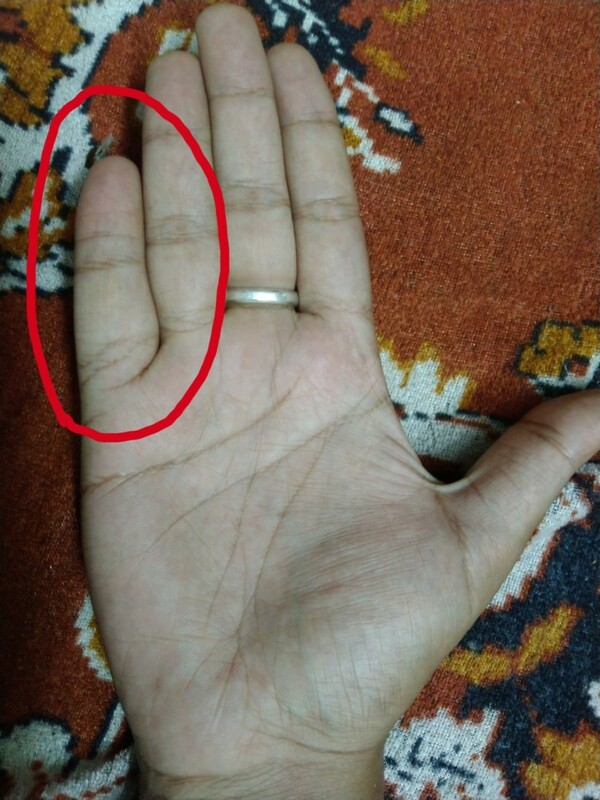 One could also say that the proximal crease of the pinky finger is incomplete / partly missing here. PS. Very good that you asked for confirmation regarding the amount of bendings (3 is normal, even in cases of pinky fingers with apparently only 2 phalanges in true cases of a single interphalangeal crease). Did you see this discussion?